Luray Cavern Review, Admission Coupons, and a Stalagpipe Video! An Experience Like No Other...for Less! We've been to Luray Cavern twice. The first time was almost our last. But first...want discount tickets? Keep reading and I'll tell you how...plus I'll show you a spectacular, narrated YouTube video that will show you exactly what you'll see in the cavern. Okay, back to our first visit. Alex, our then 3-year-old, was scared of the dark. So as we descended down the stone steps into the cave he started murmuring, "I don't like this. Can we go now?" Luckily, once he saw that the cave was indeed lit (and after numerous hugs and reassurances) he reluctantly started the tour (in my arms...all 30 pounds of him). But from time to time, he would whisper, "It's dark. Can we go now?" We'd gotten about 15 minutes into the informative Luray Cavern tour when...snap! Our section of the mile-long trail was plunged into darkness, save for the lights of a lower section. If he could've figured out where to go, poor Alex would've skedaddled out of that section. Luckily, our plucky (and knowledgeable) guide calmly said, "Someone just flicked a switch they shouldn't have. The lights'll be back on in just a sec'." She was right; they were, and we managed to coax Alex into continuing the tour. 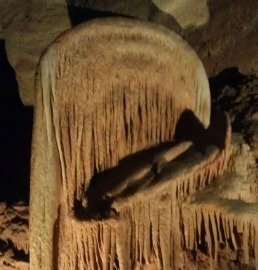 This shield formation at Grand Caverns is similar to what you'll see at Luray Cavern. When we came back nine months later, Alex was pre-t-t-y reluctant to take the tour. No worries. As the only boy among six cousins visiting that day, he quickly overcame his reluctance and took it like the "man" he was. And had a great time! So why don't I have any pictures of Luray Cavern? Because (silly me!) on my first visit I assumed that you couldn't take photos in the cavern (not true, you can). On my second trip? I forgot my camera...so the photo above is of Virginia's Grand Cavern. Luray Cavern is the largest and most popular cavern in the eastern United States. With 1.23 miles of cave to tour, it's big enough to give you a full appreciation of its magnificent stalagtites and stalagmites, but not so big that or hilly to be strenuous. You can easily lift a light stroller up or down the 70 steps on the tour (wheelchairs may be another story). It's also a nice retreat from a either a hot summer day or a cold winter's morning, having a constant temp of 54 degrees Fahrenheit year round. To me, that meant that, despite the heat outside, I changed into long pants, a sweatshirt and a leather jacket to enter the caven. I needn't have bothered. It felt much warmer (perhaps due to the relatively high humidity in the cave) and I shed my jacket within 15 minutes. It's really a comfortable temperature. Is the Luray Cavern tour worth the high price? If you love caves, ABSOLUTELY! The tour guides are awesome, funny, and very knowledgeable. The cave itself is amazing...knowing you're deep inside the earth, stalagtites (or is it stalagmites?) dripping with water, fantastically odd formations all around you...it's an experience like none other on (or below) earth. Looking at the formations is kind of like a rock version of cloud watching--they've named some formations (like the White Ghost and the Fried Eggs) but you can use your own imagination. Near the end of every tour, they come to the Ballroom, where you can hear the only stalagpipe organ in the world play the old hymn, "A Mighty Fortress is Our God." Just outside Luray Cavern are several other attractions. The Car and Carriage Caravan Museum (included in the general admission fee) is a treat for car lovers, featuring a variety of models from 150-year-0ld carriages, to Model T's, to souped up roadsters. Some young kids will breeze through it (ours did), but it opens into the gift shop, which may buy you a little more time to enjoy the exhibit. Our kids LOVED the Garden Maze, an acre-sized maze featuring 1,500 sky-high (okay, 8 feet) Arborvitae, and cool clues to solve to help you find your way through. As they describe it "The twisting pathways lead past fountains and into a cave. At 40 points, the challenger must choose a direction to solve the riddle and emerge from the maze. An elevated platform provides relief for those hopelessly lost" (with six kids guiding us, we managed to not have to use it!). They also offer a few new attractions, including a Ropes Course Adventure, a Vineyard, a Gem Sluice and more. For details on these attractions, and what they cost, click the link in the "Discounts" section below. So how much will a tour of Luray Cavern cost you? It's not cheap, but there are some discounts. Click here for hours, admission, the ONLY ticket discounts available, and information on other sights at Luray. You'll also find information on lodging options and places to eat during your visit. And for info on the local town of Luray, click here.